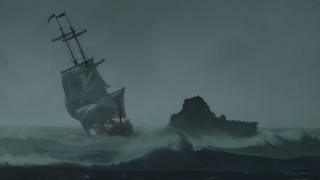 A shipwreck has been rediscovered at the same spot a similar wreckage was filmed for the BBC TV drama Poldark. The remains of the Schiedam - which sank in the 17th century - were first found off the coast of Cornwall in 1971 but then buried under shifting sands. Divers David Gibbins and Mark Milburn made the find after many attempts at Gunwalloe Church Cove. They were praised by Historic England for "ensuring the story of the site is not lost". The makers of Poldark - which follows the life of Ross Poldark at the Cornish tin mines after returning from the American War of Independence - filmed the shipwreck scene in the summer of 2014. The Schiedam, part of a fleet carrying ordnance, tools, horses and people back from Tangier, sank in 1683. Its wreck predates the setting of Poldark by about a century, but Mr Gibbins said the similarities are striking. "You would have seen local people lining the shore just as the film crew were that day in 2014, and flotsam coming ashore at exactly the same place. "We'd searched the cove many times for the Schiedam, but only seen sand. Then the breakthrough came one day after a storm. "Snorkelling north over the cove, we saw not just one cannon, but three - it was incredibly exciting." Historic England is responsible for managing the site and uses diving teams to monitor the wreckage. Alison James, the public body's Maritime Archaeologist, said: "We are delighted to work with divers like Mark and David to help ensure that England's protected wreck sites are enjoyed and protected for years to come. "They are helping to ensure that the story of the site is not lost and is known to a wider audience."